Carlisle Thai Cuisine is located at 141 West High Street in Downtown Carlisle, Pennsylvania. It’s conveniently located off Interstate 81 as well as the Pennsylvania Turnpike (I-76). 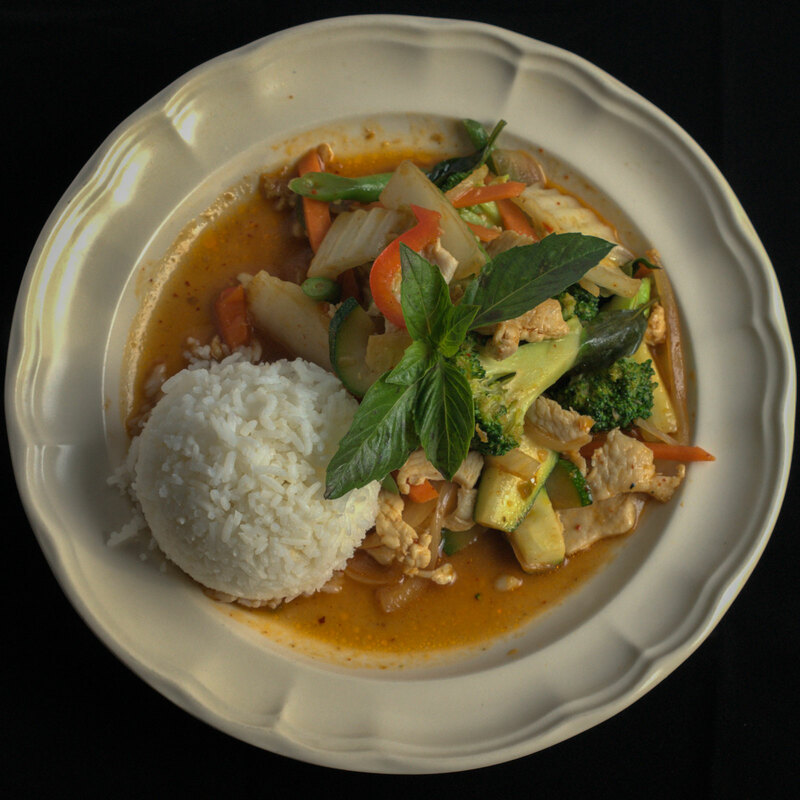 While Carlisle has a plethora of dining options for a borough of its size, they offer the only full Thai menu in town. 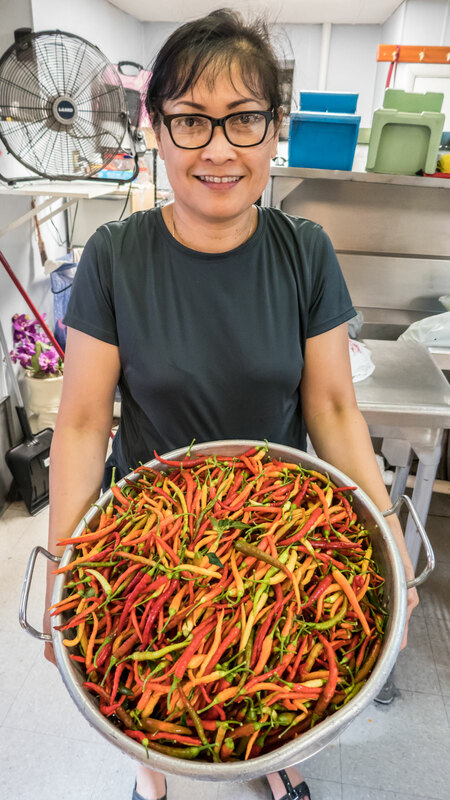 Owner and head chef, Joy Boonjirayuth was born in Pratchinburi, Thailand and lived in Japan and Lancaster County before moving to Carlisle. The former White Elephant was in its second incarnation when Joy was offered the business. Besides working part time at a Thai restaurant in Lancaster, she had no experience in the restaurant business. In her prior life, she worked in manufacturing. It was her paternal grandmother who taught her how to cook at age ten. Grandma’s instructions were simple: if your heart is not into it, don’t do it. Joy is quick to tell stories of how her Grandmother would tell her to stop cooking if she didn’t have a smile on her face. It’s important to note that Joy grew up eating everything fresh. Her family had no electricity. The menu is in its second incarnation and Joy is constantly tweaking it. When you enter the restaurant from High Street, you see the daily specials on the blackboard. Lucky bags, larb pra salmon, and Thai sausage are just some examples of what people might see on any given night. Joy loves hearing about people’s visits to Thailand, especially since she’s been too busy to go back and visit. Last year, a customer asked her why she doesn’t sell goong op woonsen. Well, it’s on the menu now along with other quirky ideas she gets like Siamese ceviche and Rolling Stones. There’s a favorite dish made famous in Bangkok’s Chinatown (gooay teow cuo gai), which is basically chicken, rice noodles, and salted squid. Although it’s not on the menu yet, Joy is happy to make it if you ask. For a small borough in Central Pennsylvania, Carlisle has a diverse population. The fact that it the restaurant is located next to Dickinson College draws an even more diverse crowd. Many of the students come from New York City and are used to getting the best of the best. The fact that they keep coming back has Joy convinced that she’s doing something right. The restaurant is closed on Sundays and Joy often uses this time to get ideas. 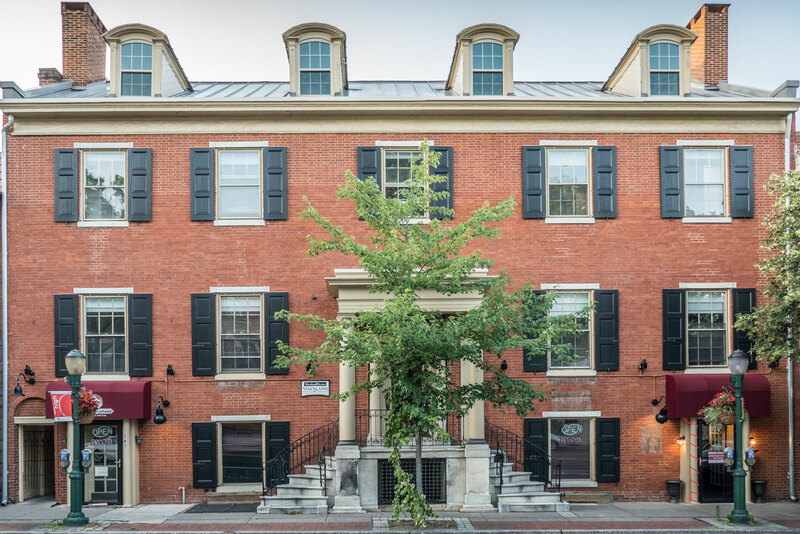 Although she has not gone back to Thailand as frequently as she would like to since buying the business, she is a day trip away from Baltimore, New York City, Philadelphia and Washington, D.C. Many of her ideas have come from visiting areas like Philadelphia’s Cambodia Town and Elmhurst in New York City. With an energy level beyond most people half her age, there’s no telling where Joy will take her business to next. In 2016 she changed the name from White Elephant to Carlisle Thai Cuisine. When asked why Joy explained that there were two reasons for the name change. First, White Elephant has a male connotation and her restaurant is a woman-owned and operated business. Second, it was the name chosen by the previous (male) owner. Finally, she wanted to include the name of the community that has been so supportive. Before buying White Elephant from the previous owner, Joy had no business experience. She’s thankful that the community has been so supportive while she learns as she goes. As for what’s next, Joy held her first Big Bite event in April of 2017. The event sold out in two weeks and she already has Big Bite of Asia scheduled for June 20. 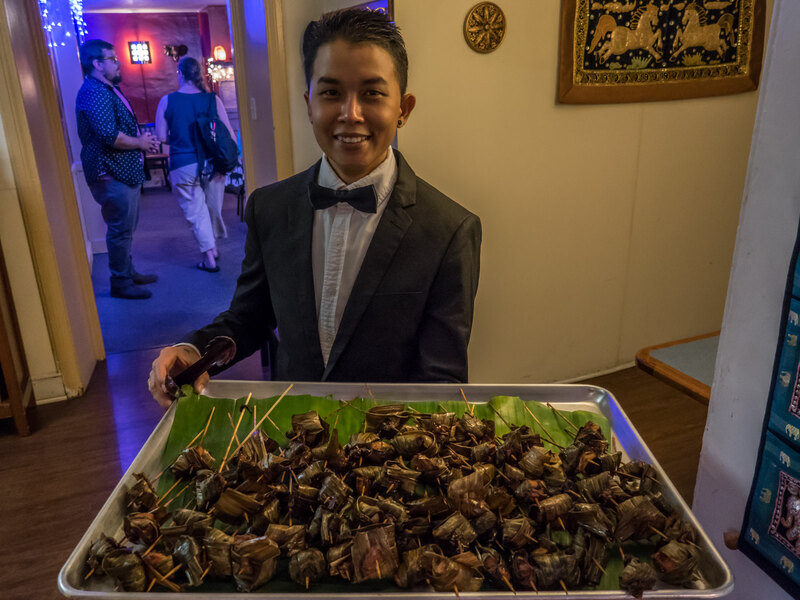 Attendees should expect Thai dishes, not on the regular menu as well as a taste of India and a special surprise. For the latest on her Big Bite Events, check out her Facebook page. The food looks very nice. Very inviting. Yes I totally agree with her grandma. If you cook with your heart it shows in your food, it tastes differently. The restaurant and the dishes look amazing! 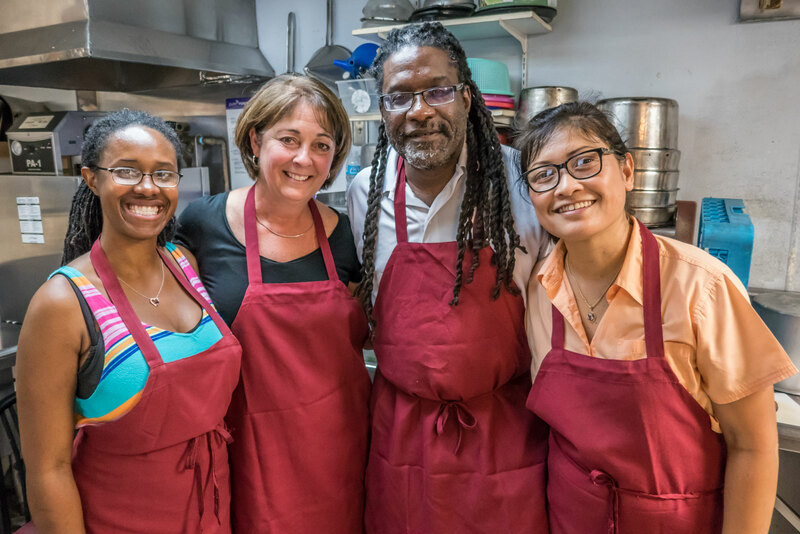 The team is smiling, and we know Thai food can’t be a bad decision – so this place is worth a visit! Mmm, that plate of food looks good. I hope it tastes as good as it looks. 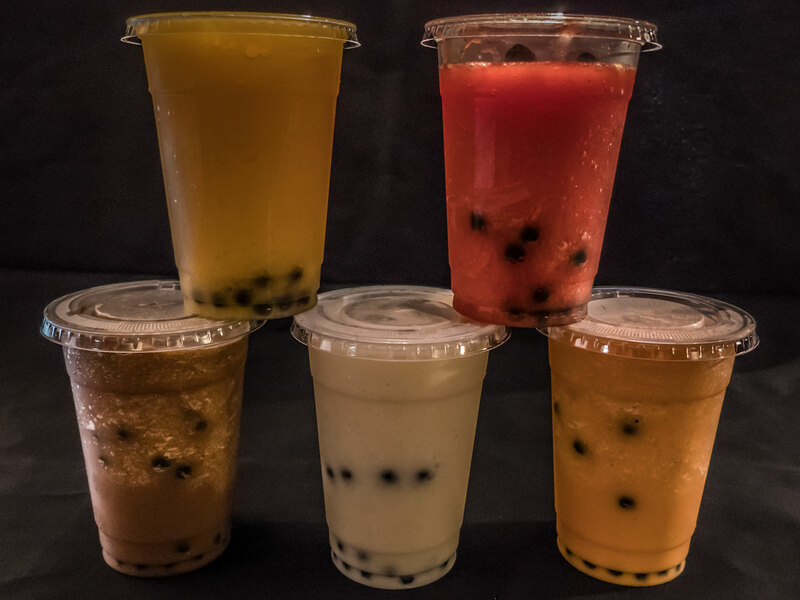 And I love bubble teas! I think Joy is an amazing woman and I love that she’s passionate about her cooking and her business. It’s nice that she keeps the excitement and energy up by constantly tweaking the menu and what-not. I love Thai cuisine and it would be nice to dine here. What a beautiful thought .. if your heart isn’t into it, don’t do it. Grandmothers are the best, are they not? I also loved about her that she’s always looking for inspiration and doesn’t want to let herself be stagnate. Not only does her food look incredible, but Joy is such an inspiration as well! I love Thai food it’s one of my favourite cuisines although I have a few. The food there looks delicious and the drinks look good too. Joy sounds like such a sweet woman!